Birdie and I went to Sabino Canyon Recreation Area two days in a row for hiking. It was the weekend and the parking lot was full both mornings. Popular place. Broad-billed Hummingbird feeding from an Ocotillo bloom outside the Visitor Center. On Saturday we took the tram all the way into Sabino Canyon to the trailhead. Cars aren't allowed on this road anymore because it is so narrow, and because usage is so high these days. You have to walk or take the tram. We have arrived at the end of the paved road and the beginning of the wilderness. It is 1/2 mile up a series of switchbacks to the Phoneline Trail that we will be hiking. My two hiking victims, er, companions of the day are Birdie and Red. Here we go into the wilderness. Looking back down the canyon. You can see the loop where the tram left us off. You can see some of the trail ahead, about half way up the mountain. Come on girls, this next section is level. We have reached the Phoneline Trail. Looking back at the switchbacks. 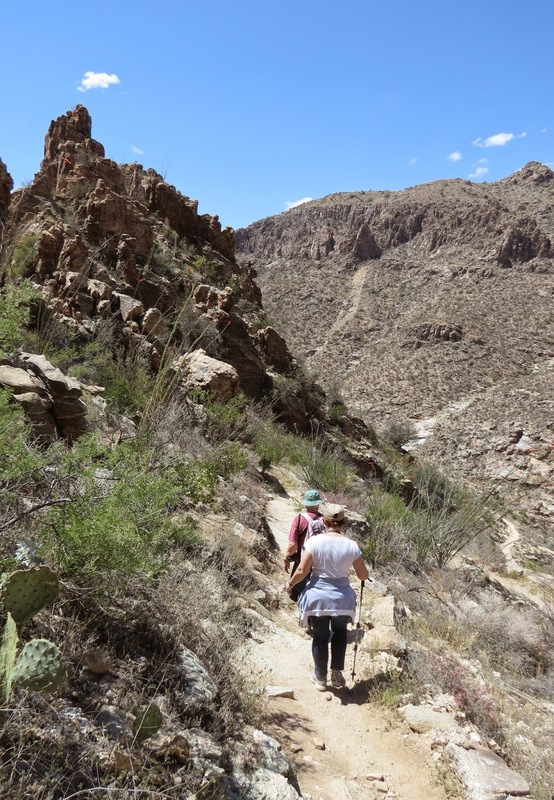 We ecided to go back down via the Historic Sabino Trail. Historic as in original, before the idea of creating switchbacks. Sabino Creek is popular with visitors. We did not see a lot of people on our trail. Pretty Mallard in the creek. On Sunday Birdie and I went back, this time to hike in Bear Canyon. We hiked on the 7 Falls Trail. We saw several blooming cactus here. Bees like this one. 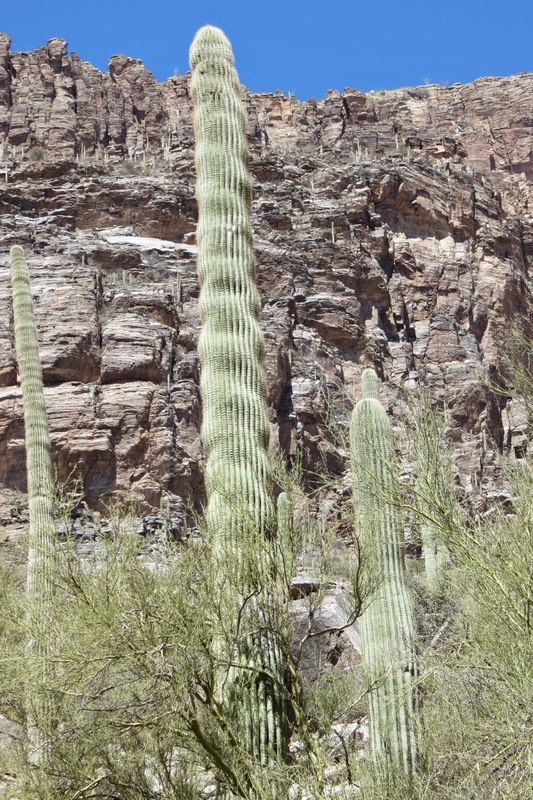 The Saguaro are all budded and starting to bloom too. Our hike begins through a forest of Saguaro. It follows the creek up the canyon to the 7 falls. There was not a lot of water in the creek. But each time we crossed the creek there was a tiny waterfall. Never having been here before, we thought they might be some of the 7, so Birdie started counting them. It was getting pretty hot. And the trail was crowded with families going faster than us. We kept having to step aside to allow people to pass. When we reached the 7th crossing, Birdie announced we had arrived at the 7th waterfall. In reality, all 7 were still ahead of us...up a series of rocky switchbacks. Neither one of us were up for it, so we ate lunch and turned around. I'm turning into a wimp in my old age...but I'll blame it on the heat. Time to move on to cooler places. We passed this curly cactus on the way back. The tail is lined with tufted Fountain Plants. I learned that in the Visitors' Center. Lots of huge boulders strewn here during an earthquake. Our feet were hurting too. Mine especially...I need a new pair of hiking boots. 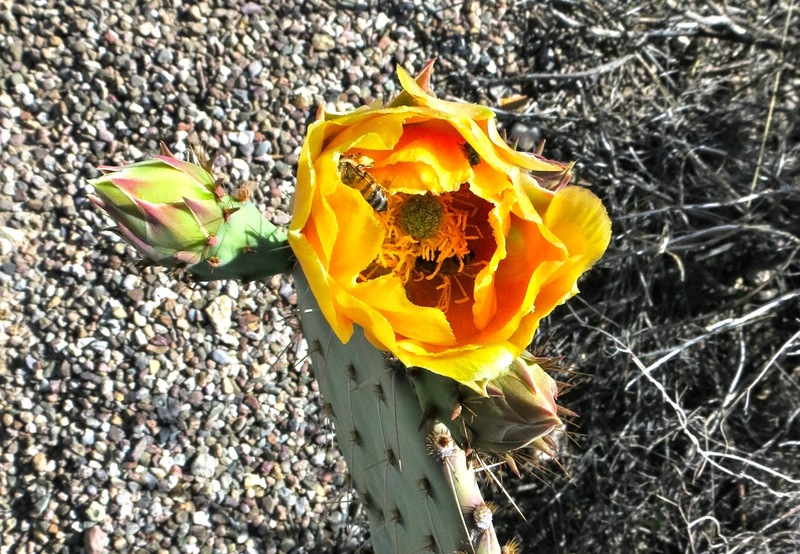 Did you know that the Saguaro bloom is Arizona's State Flower?